Please download the app named "IUSB Drive" from app store(IOS system). Android Smartphones do not download app,but the phone need with otg function and when you connect the card reader, please enter to the phone "file manager" to operate. 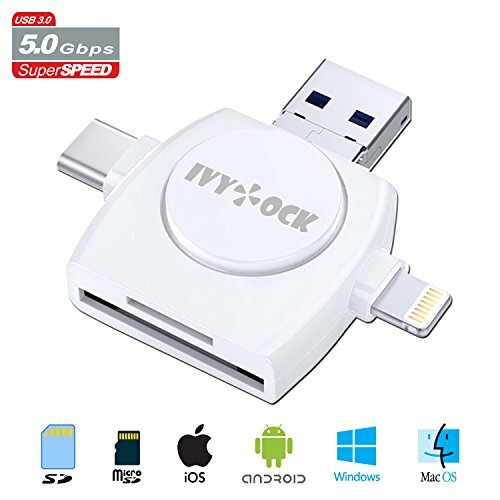 【MultiI-function 4-in-1 Reader】-IVYOCK smartphone card reader is designed with 4 interfaces : Lightning adapter for iOS devices ( Made for iPhone X / 8 / 8 Plus / 7 / 7 Plus / 6s / 6s Plus / 5s, iPad Pro / Air 2 / Mini 2 / Mini 4, iPod, iOS 8-11 or Later ) ; Micro USB adapter for Android phone or tablet with OTG function ; USB C adapter for Samsung or LG phone with Type C port ; USB adapter for Computer / iMac / Mac / laptop. 【Two Card Slots】- IVYOCK USB Memory Card Reader support SD / Micro SD card up to 256G, including SDXC / SDHC / SD / Extreme I III SD / Ultra II SD or Micro SD / TF / Micro SDXC / Micro SDHC / UHS-I . 【 Best Camera Companion】 - Great for anyone capturing photo or video with a action camera or trail game camera. Small, portable design , sharing pictures in the SLR camera to friends by the phone whenever and wherever. 【Shoot direct】 Use the in-app camera to save photos and videos directly to SD card so you can free up your phone's memory for other things. 【Easy to Manage and Backup Your Files 】- iOS devices (iPhone / iPad / iPod) works with use of free file management app named " IUSB Drive " (App Store) . Manage SD / Micro SD cards' data and files directly on the smartphone (Create, Copy, Move, Delete, Rename, etc. ), Plug and play for other device , no app required .